Jeremy Paxman is a journalist, best known for his work presenting BBC's Newsnight and University Challenge. He is also an author and his books include Friends in High Places, The English and The Political Animal. Jeremy Paxman was born Jeremy Dickson Paxman on 11 May 1950, in Leeds, Yorkshire, England. He was brought up in Yorkshire and Peopleton, near Pershore, Worcestershire. In 1964, he went to Malvern College, an independent school, and later read English at St Catharine's College, Cambridge, where he edited the undergraduate newspaper Varsity. While at Cambridge, Paxman was briefly a member of the Labor Club. His mother Joan McKay was a housewife, and his father Arthur Keith Paxman worked in industry. Paxman is the eldest of four children and has two brothers and a sister. His journalistic career began in Northern Ireland, where he covered the Troubles for three years. He was a reporter on Tonight and then for five years on Panorama, where assignments took him all over the world. After a few undistinguished months of Reading Aloud on the Six O'Clock News, he became a presenter in the mid-80s, working first on the regional news programme London Plus (known within the building as "Sod Off Kent") and then on the BBC's Breakfast Time. For four years he presented Start the Week on Radio Four before deciding that he didn't like getting up that early in the morning. He has chaired University Challenge since 1994, where his capacity for mispronouncing Italian has led to frequent complaints. His books include Friends in High Places; Fish, Fishing and the Meaning of Life; The English; The Political Animal and On Royalty, some of which are almost readable. Jeremy Paxman is arguably Britain's most respected political journalist, renowned for his tough, rigorous interviewing of public figures. He was born in Leeds and educated at a prestigious private school, Malvern College. He graduated from Cambridge University with a degree in English. He joined the BBC as a trainee in 1972 and began working on BBC radio. He worked as a foreign correspondent for BBC television news and read the Six O'clock News. In 1989, Paxman took on what has become the defining job in his career, presenting Newsnight (1980). 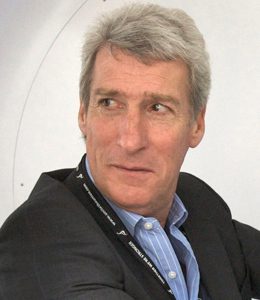 Although Newsnight had been on the air for nine years previously, and has been presented by other presenters since, Paxman and Newsnight have become synonymous for most people, and he remains with the series to this day. He is happily married to his partner Elizabeth Ann Clough. They live in Stonor, southeast Oxfordshire. They have three children. His pictures can be found in the internet at various websites. He is an open person and his pictures are available elsewhere on the web. He is six feet three inches tall which equals 191 centimeters. That is a significant height for a TV personality. He is an English national and he is from white ethnicity. He was awarded the Richard Dimbleby Award, BAFTA's most prestigious current affairs honor, in 1996 and again in 2000. In 1999, Jeremy received an honorary degree from Bradford University, in recognition of his work as a television journalist. He was awarded as the Broadcasting Press Guild's award for best non-acting performer. He won the Royal Television Society TV journalism presenter of the year award in 2002 and 2007.